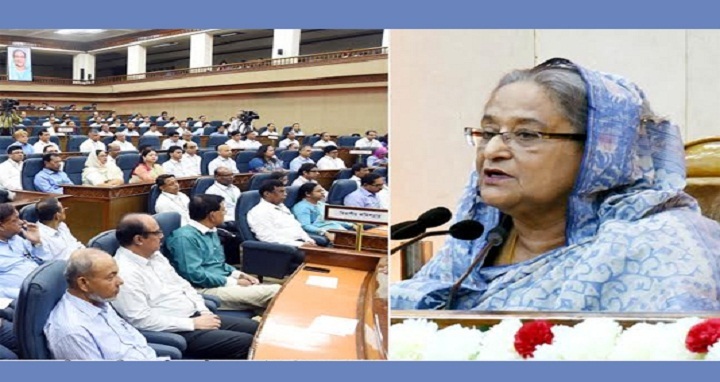 Dhaka, 24 July, Abnews: Prime Minister Sheikh Hasina today gave 23- point directives to the deputy commissioners (DCs) while inaugurating the three-day DCs Conference- 2018 at the Prime Minister’s Office here. 1. Keep a sharp vigil so that people do not become victims of harassment and deprivation in any way in receiving government services. 2. Save the youth community from narcotics and continue drives against drugs. 3. Discharge your duty with more sincerity to maintain peace, discipline and stability by stamping out militancy, terrorism and communalism. 4. Take initiatives for alleviating poverty through rural infrastructure development, flourishing potential local small and medium industries and creating employment. 5. Give leadership to develop and flourish information and communication technology. 6. Work together with the public representatives in establishing good governance at the grassroots level. 7. Take measures to increase female education rate and bring back the dropped out students in the mainstream. 8. Keep a sharp eye on raising transparency and efficiency of land administration and management and protecting government lands. 9. Take all necessary steps for an uninterrupted supply of fertilizers, seeds, electricity and fuel to boost agriculture production. 10. Create massive mass awareness about preventing marketing of adulterated food items and curbing this unethical practice with iron hands. 11. Further strengthen the community clinic activities to ensure healthcare services to the poor and underprivileged community. 12. Raise mass awareness about protecting environment and ensuring a proper enforcement of laws and rules related to it. 13. Take right steps at right time according to the Disaster Management Law, 2012 and its related directives to mitigate the impacts of natural disasters. 14. Make effective the village courts to provide justice to the common people easily and reduce case logs in the courts. 15. Make all district-level committees active, dynamic and fruitful. 16. Strengthen activities including observance of the information fair, the service week to reach existing services of the government offices at the grassroots level. 17. Take steps for maintaining peace in the industrial zones and uninterrupted good transportation and export-import as well as rooting out tender manipulation, muscle power and terrorism. 18. Give importance to the round-the-clock monitoring of market management and contain any ill efforts for creating artificial crisis in the market. 19. Increase surveillance to stop woman and child repression and trafficking, dowry, eve teasing and early marriage. 20. Ensure undertaking proper legal steps to halt violence and repression as well as hostile attitudes against women. 21. Increase facilities of sports, entertainment and creative cultural activities in your respective districts and awaken the spirit of the liberation war and cultural and science mind among the children and juveniles. 22. Take special measures for the disabled, autistic and the disadvantageous community.